Like a Zen koan, “write without teachers” is not literally what its individual words signify but instead gestures to a larger sense, a perspective or type of consciousness. As a koan, “write without teachers” is not literally a full renunciation of the classroom teacher. One of the ways Elbow in Writing Without Teachers invites us to dwell with an enigma is through positing a metaphoric “absence” for teachers—the “without” part of that title. This metaphoric absence becomes a new role for writing instructors and offers an opportunity to engage in underlife. In this case, it’s a question of whether the teacher-reader is ready to step aside and create a more student-centered developmental course, one which is devoted to studying with students the act of invention. At the same time, the irrelevance of teachers is not entirely metaphoric. Elbow maintains that “learning is independent of teaching” and says, “I had come to notice a fundamental asymmetry: students can learn without teachers even though teachers cannot teach without students. The deepest dependency is not of students upon teachers, but of teachers upon students” (xviii). He adds that this most fundamental of his claims is “directly reflected in the title phrase, ‘without teachers’” (xviii). The paradox of Writing Without Teachers comes from the way in which Elbow invites writing specialists to accept their irrelevance to learning and to build a different curriculum around that truth. But Elbow encourages us time and time again to accept the enigma not just of our respective educational roles but also of the enigma of writing. As writers and writing teachers we are both in and out of control of the work of composing. In this view, the writing process is expansive and larger than our own individual consciousness: like an iceberg, we only see the tip of the writing process during moments in a course. Much of writing is submerged, “under,” and joins the enigmatic activities of the underlife. With traditional instruction, the student supposedly subordinates herself to the teacher, but with Elbow’s work, you (student or teacher) subordinate yourself to that mystery of writing. The credo of a writing teacher could read: The teacher to the student: "When I write, I am just as much in a space of chaos and possibility, of the unknown and of meaning that you are when you, non-teacher, write. When I teach writing, I am willing to admit this position, to show that I am open to the chaos and possibility, to the lack of certainty and to the joy of using words." Personally, I have thought long and hard about my own relation to “writing without teachers.” I have given consideration to my own “absence” in the classroom. Ever since I was pursuing my second MFA at the University of Massachusetts, Amherst, and was told in a TA training session that some instructors write, “Welcome, writer!” on the chalk board on the first day, I was hooked. How is it that I can cheer along Elbow in his critique of writing teachers and continue to be a teacher myself? How is it that I can feel so strongly about the limitations placed by writing instructors and academia on the act of writing and at the same time know that I owe so much to my own teachers? Can I, for instance, discount the fact that a seminar taught by Peter Elbow continues to have reverberations in my teaching fifteen years after the fact? Is it vanity to think (along with everyone else) that I can be a “different kind” of teacher, one who does less harm, one who presents fewer unnecessary roadblocks to my students’ writing? Why do I have this habit of telling my students that I am a “writer first, teacher second”? One answer I have determined for myself is that it has been those teachers in my past who promoted the underlife in their classes—who through their various gestures and communications afforded my writing the possibility of an existence beyond their purview—who have made me believe that a writing education is a powerful thing indeed. With koans, the master didn’t help or provide the answers: instead, novices needed to do a lot of work on their own, a sort of self-education. Much like self-help, a koan entails life-long learning with no time-frame to resolution. It could take years (if ever) to find a resolution to the koan, much as the questions posed by Elbow in his early work still resonate with ambiguity. What Is the Sound of Teaching Without a Teacher? 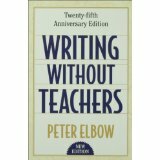 Since its publication in 1973, Elbow’s Writing Without Teachers has served a dual function. For general readers, the book functions as a self-help text offering suggestions about composing and writer’s blocks; for academic readers, on the other hand, the book’s critique of their profession is an invitation to dwell with an enigma. Can we become stronger writing teachers by resigning our postures of mastery and accepting our flaws—even our irrelevance to learning? Can we build a writing curriculum and pedagogy that include interests and perspectives from outside the academy? Writing Without Teachers, a book seeped in metaphor and affected by twin audiences (scholars and people outside of academia) continues to resonate with its multiple meanings, its ambiguities (but never its ambivalence). This ambiguity, however, has been often overlooked inside academia. Undergraduate students usually have a fresher perspective on Writing Without Teachers and Elbow’s project than writing specialists. They can see its oddity as well as the paradox of such a book existing inside academic settings. On several occasions when teaching Elbow to non-English majors who I would guess with near certainty are unfamiliar with anything about composition theory, the students have reacted immediately to the book title: they look downright quizzical. Elbow’s ideas have become so deeply embedded into our whole praxis as writing scholars and teachers that we often don’t recognize his influence. Elbow is like using the same handout semester after semester that someone lent us during graduate school, the ink and the authorship of the handout becoming that much more ambiguous with each passage through the copier machine. For students, on the other hand, the title can open a whole new plane of thinking: that they could complete writing that a teacher doesn’t see—and perhaps more phenomenally—that their writing instructor would even raise this possibility. For scholars just starting their careers in the early to mid 1970’s, the approach of Writing Without Teachers did strike them as a total mind shift. For Theresa Enos, Elbow’s book was the impetus for her selection of Composition and Rhetoric as her discipline. One of her teachers in graduate school, Gary Tate, assigned Writing without Teachers to Enos, and she was “kind of blown away by the book” (interview with Enos). A brand-new teaching assistant, Enos began using freewriting in all her classes and found that “Elbow was so completely different [from the modes-based instruction at her institution]. You were actually working with the student, intervening in the writing process ( which was the whole point of the process revolution). It was a 100% turn-around, and I could see the engagement of the students. I could see the cognitive process. I could see their brain working through this freewriting” (interview with Enos). Other established composition theorists including Duane Roen (interview) and Lad Tobin describe their teaching styles prior to exposure to Writing Without Teachers as somewhat benighted—and how Elbow’s work helped them perceive students and the purpose of teaching more clearly. Writing Without Teachers has functioned as a koan for writing scholars, leading us to consider paradoxes inherent in writing instruction. In the Eastern tradition of spiritual learning, the enigmatic figures prominently in the form of the koan. Novices in Zen training approached master monks with a question to which the monk would reply with a seemingly inscrutable answer—either verbally or physically. Zen masters were known to resort to hitting, beating, and even maiming students, but they also used incoherence, ambiguity, imagery, and repetition to instruct. Together, the initial question and the monk’s response served as a form of independent study for the novice who would spend an unprescribed amount of time working toward its solution. As D.T. Suzuki describes the koan in Zen Buddhism, the koan is intended to develop Zen consciousness by surpassing the limits of logic and intellectualism: “the koan given to the uninitiated is intended to ‘destroy the root of life,’ ‘to make the calculating mind die’, ‘to root out the entire mind that has been at work since eternity’” (138). Among the many paradoxes of Writing Without Teachers would be the yin-yang relationship of chaos and control, solitude and readership, creativity and analysis, doubt and belief. In “East Meets West: Peter Elbow’s ‘Embracing’ of ‘Contraries’ Across Cultures,” George Kalamaras describes the ways in which Elbow has engaged paradox throughout his career. Although Kalamaras is speaking of Elbow’s overall work with doubt and belief, Kalamaras’ description is also applicable to the 1973 book, how Elbow points to "the importance of remaining attentive to the interaction of what might on the surface be considered contradictory. This is similar to the use of Zen Buddhist koans (such as 'What is your face before your parents were born?,' whose paradoxical structure serves to sever the question from the answer (and, paradoxically, even from the questioner), reorienting one to a fresh experience of reality" (117). And then there’s the question of the identity of Elbow’s “real” Writing without Teachers reader, given his choice to publish with a university press and given his own position inside academia. Does Elbow really mean that we should write totally without teachers, or is there some sort of half-way state? If we are a teacher-reader of Writing without Teachers, does this mean we should cease all teaching in order to teach? In my next post, I will consider the paradox—or tautology—in that notion. Here are poems two people wrote using the Build-A-Poem post from November. Both poems were written within ten minutes and on-the-spot. Thanks to the two writers for sharing. Feel free to post your own Build-A-Poem creations as comments. Nana, her shadow is standing upright not hunch over struggling to stand walk or balance. Captured in glazed pottery, blue sky. Hung low around late for. Love is like the flower blooming. Cliches are like gray sky. The shadow is small - when did it change?